So there are definitely competing interests at work here. On the one hand you have the sloth, a creature whose entire evolutionary path has been predicated on remaining inert and tree-colored so as to remain invisible to predators. And on the other hand you have Hadas, whose entire vacation is predicated on the desire to spot sloths in their natural habitat. After a five-hour hike in Cahuita National Park yesterday, the sloths are definitely winning. 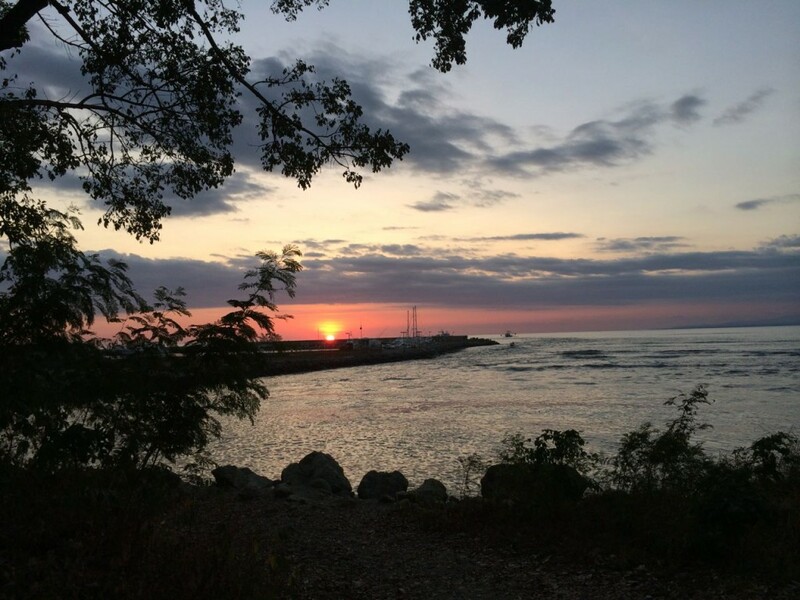 Cahuita National Park is a large swath of jungle, smack up against the ocean just north of the town of Cahuita. Knowing that animals are — like Matt Lauer — friskier at dawn, we awoke at 5 a.m, in order to be in the park right when it opened at 6 a.m. After signing the entry log and donating $10 ($500 billion in colones) we were immediately rewarded by a family of frisky capuchin monkeys cavorting in the trees above our heads. Unlike sloths, monkeys make plenty of noise and occasionally rifle the telltale fruit pit at your head. They’re not hard to spot. Hadas clapped her hands and made a noise like a toddler with a kitten. The day of animal watching was on! But not so much animal photographing. I have discovered an amazing knack for not being able to capture photos of wildlife. If I worked for the Sears Portrait Studio, the vast majority of my photos would contain a tasteful mottled background and perhaps a blurry elbow. Parque Cahuita’s trail winds along the edge of the jungle within site of the ocean shore. The path was wide and flat, and soon we were deep into the park, enjoying the (relatively) cool morning. The jungle was alive with bird and insect sounds, plus Hadas imitating all the bird and insect sounds. She has an uncanny knack for mimicry, which will come in handy if she ever pursues a career as a parrot. As the very first people in the park we were rewarded with quiet, solitude and the occasional horror of walking through a web strung across the path by a spider the size of Matt Lauer. It didn’t take us long to get the heebie-jeebies, especially because we were walking along the path with our necks craned to the treetops looking for sloths. Every so often we would glance ahead and just avoid an enormous spider that was about to luck out into a kosher meal. After ninety minutes we had still seen no sloths. We stopped at every tree that looked sloth-habitable and did a slow scan. We pulled out the binoculars and examined the branches, trunks and treetops. No sloths. Above us a family of howler monkeys swung down to take a closer look, and then sat on the branches eating fruit and watching us with disdain. A family of raccoons cavorted around the base of a tree, just feet from us. Bats swooped around our heads. A snake slithered through the grass. Lizards and crabs danced quickly away as we walked down the path. 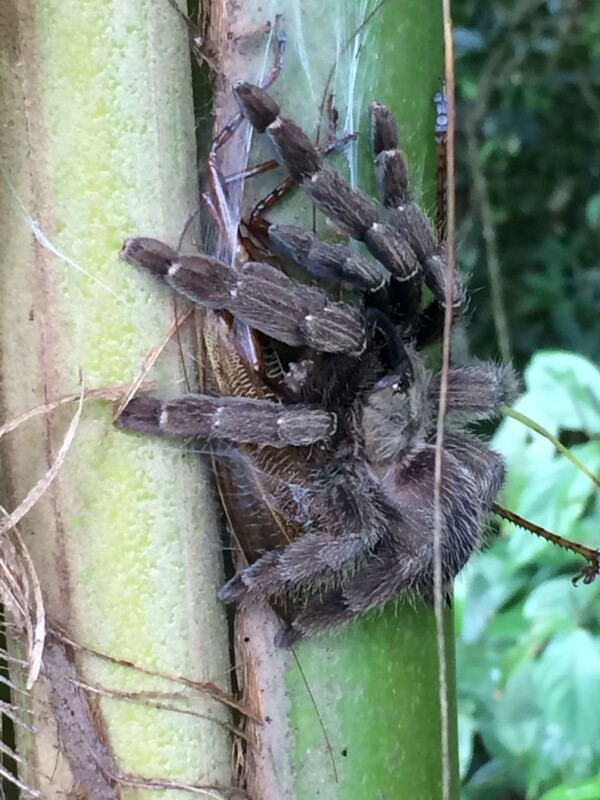 We even saw a tarantula eating a giant moth on the side of a banana plant. After three hours of hiking we were hot, tired and slothless, so we turned around to make the long trek back to the trailhead. Within a few minutes we came across two friendly park rangers, who examined our park entry ticket and asked us what animals we’d seen. We gave them the list: monkeys (monos), raccoons (mapeches), bats (murcielagos), snakes (serpientes), tarantulas (spidero grande). “No peresosos (sloths)?” they asked. And there it was. Directly above our heads, in a tree we had just been looking at, a sleeping sloth. We all had a good laugh and the park rangers went on their way while we gazed at the sloth through our binoculars. About one minute later, one of the park rangers poked his head around the bend ahead of us and whistled, gesturing for us to come along the path. We hustled down the trail and, yep, he’d spotted another sloth. This one was actually climbing a tree. Hadas squealed and clapped her hands while I took a series of photos that did not, technically, contain the sloth. I joked to Hadas that even though we were terrible at spotting sloths, by the time we got back to our car there would be a sloth sitting on the hood. “Do not make promises you can’t deliver,” she said sharply. The last two hours of the hike were tiring. The temperature was rising, our feet were sore and our stash of hiking food had gotten down to the dregs that one brings just in case one takes a wrong turn and ends up in Bolivia. Finally, the park entrance mercifully appeared and we signed out of the entry log to avoid having a search-and-rescue team burst into our bedroom at 3 a.m.
We crossed the small footbridge from the park to the parking lot, and suddenly Hadas froze. Eight feet above our heads in a tree. Climbing around with a tiny, adorable baby sloth clutched to its belly fur. After five hours of not seeing the thousands of sloths in the National Park, the closest, cutest, most obvious sloth was cavorting about just steps from our car. I’m a man who keeps his promises. After I snapped a few more photos of parts of the tree that did not contain the sloth, we drove back to the B&B and napped for three hours. Then we went out for an ill-advised walk on the beach (feet: still tired) and strolled into town for a drink and some delicious guacamole with plantain chips. I actually drank a few sips of Hadas’s alcoholic beverage (some strawberry and lime concoction), at which point I removed my pants and tried to lead the restaurant in a Caribbean-flavored version of Hava Nagila. OK, I made that last part up, but I did sip on her drink. I’m a lush. After a dinner of meat on a stick from our favorite street-side vendor we strolled home and Hadas passed out at 8:30 p.m. She slept through until morning, no doubt under the influence of my drinking. This morning we checked out of our B&B early and made the long, long drive from Cahuita on the Caribbean coast to Quepos on the Pacific coast. It’s not often that you make a trans-continental drive in six hours, but Hadas was up to the task. And by up to the task, I mean she wouldn’t let me take the wheel because apparently I become pouty and unpleasant when driving. I protested by taking a nap. It was a much faster drive along the same route as the one last Thursday, primarily because there was less Sunday traffic, more passing lanes in this direction, and Hadas drives like Mario Andretti after a six-day binge of cocaine and amphetamines. We were stopped at a police checkpoint, questioned, asked to show our passports, had our backpack examined and were queried as to why exactly we had a baggie full of red pills. In Spanish, I explained that they were Ibuprofen. I also made a mental note not to pursue the career of drug smuggler, as it probably isn’t a great strategy to keep drugs in the same pocket as one’s passport. We witnessed an actual fistfight between two drivers on the side of the road, that result of which was the stouter of the two being flung into foot-deep water in a drainage ditch and temporarily strangled until he cried “Tío” or perhaps apologized for whatever transgression he had performed. In comparison, I look like a pretty calm driver. We made it through San José with only one wrong turn and sailed onto the tollway toward the Pacific coast with nary a u-turn. This, despite the fact that all road signs are painted on the side of sloths so as to be invisible to gringos. 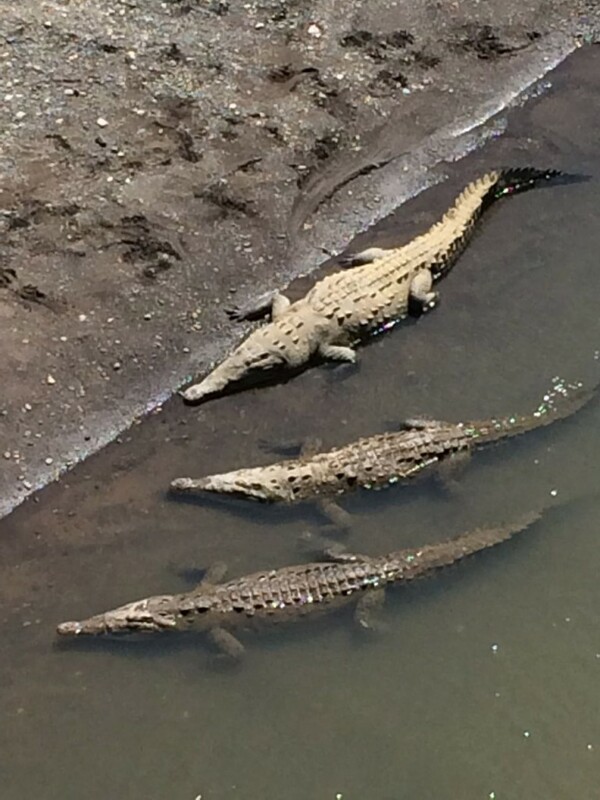 Luckily, the monotony was interrupted by a stop at the Rio Tárcoles to peer down at the crocodiles sunbathing below, which we both characterized as “Horrifying.” I made a mental note not to go river rafting. Or showering. 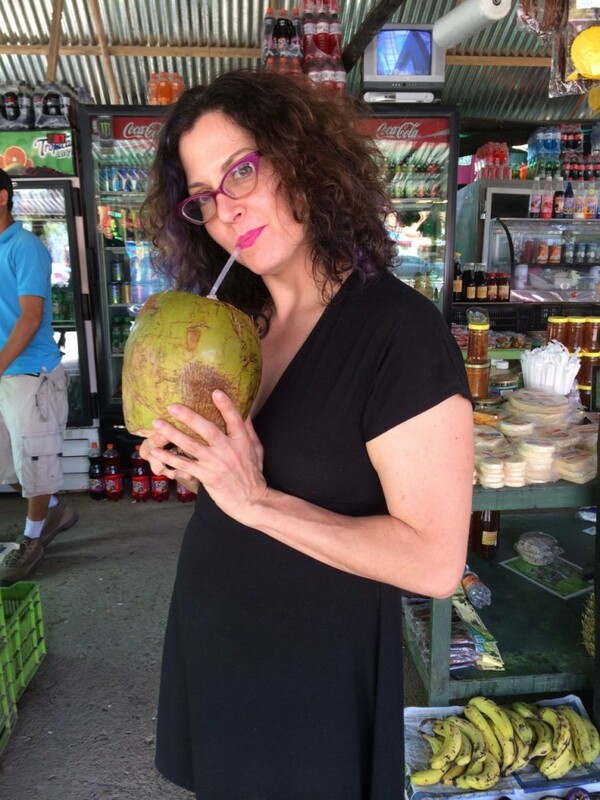 Before re-starting the drive, Hadas ordered an Agua de Pipa from a roadside fruit vendor, which turned out to be a coconut with a straw stuck into it. Delicious, if not easy to drink while driving one-handed. I’m not sure how the open container law works when the container is a coconut and the opening is a hole the size of a straw. We rolled into Quepos around 3 p.m. and drove to our cottage, which is straight up the side of a mountain overlooking the marina. When I say straight up a mountain, I mean STRAIGHT UP A MOUNTAIN. We were planning to go ziplining in Quepos, but I think we pretty much got the entire experience just winding up the driveway. As soon as we got into the cottage we were thrilled to discover a family of monkeys swinging through the trees directly outside our screened windows. We stood out on the deck and made monkey noises back and forth with them. I took a few photos of the sky. Being monkey-adjacent is a strong selling point of this place. Hadas claims she is always monkey adjacent. After a brief nap and a shower we headed out to look for a grocery store. Unfortunately, the street leading into downtown was packed with people and horses, as we had landed smack-dab in the middle of some kind of city-wide horsey parade. We ditched the car on the side of the unpassable road and walked around downtown, looking for groceries. 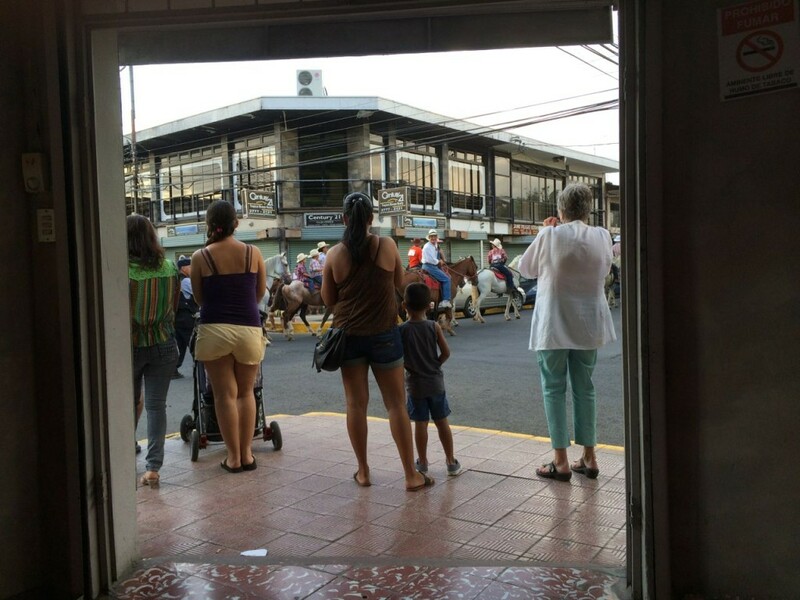 Almost every business was closed for the Sunday afternoon parade, so we eventually settled on getting dinner at a Mexican restaurant while watching the parade of trotting horses and pickup trucks with loudspeakers blaring Latin American pop music. Upon returning to the cottage, using 4-wheel-drive and rocket boosters, we discovered that the internet in our cottage had gone from barely usable to dormant, so the nice innkeepers arranged to move us into a different cottage that turned out to be in every way nicer than the one we were in. Somehow she had convinced the two people in the nicer cottage to switch cottages with us, and they had agreed. Suckers. 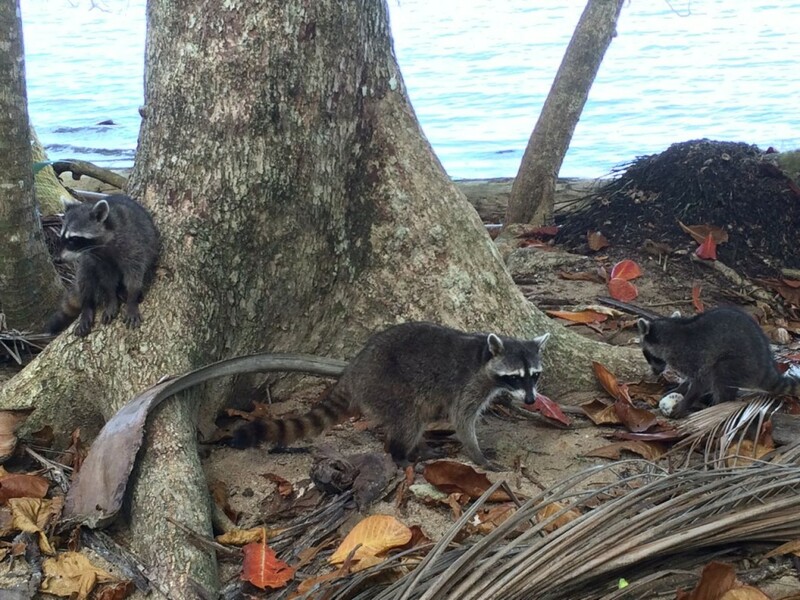 We met them later out by the pool and offered to buy them a drink, which they graciously declined. It turns out that he’s a commercial real estate appraiser from Alabama and she’s a gymnastics coach from Calgary — they had just met an hour earlier at the bus station and agreed to share a room. If anyone from NBC is reading this, feel free to contact me for rights to this hilarious sitcom premise. Now we’re sitting on the deck overlooking the harbor, watching upwards of 20 geckos munch on bugs above our heads while availing ourselves of the gloriously mediocre Internet speeds. It’s raining furiously and every so often we glance into the trees looking for monkeys, sloths or parrots. So far all I’ve spotted is Matt Lauer. Thanks for the tarantula picture. I’m now committed to creepy spider nightmares for the next week. Also, I prefer to remain blissfully ignorant of humongous spiders in the local area. I think I just added Costa Rica to my personal Do Not Go Anywhere Near Even Under Threat of Death list. What is it with you and food on a stick?